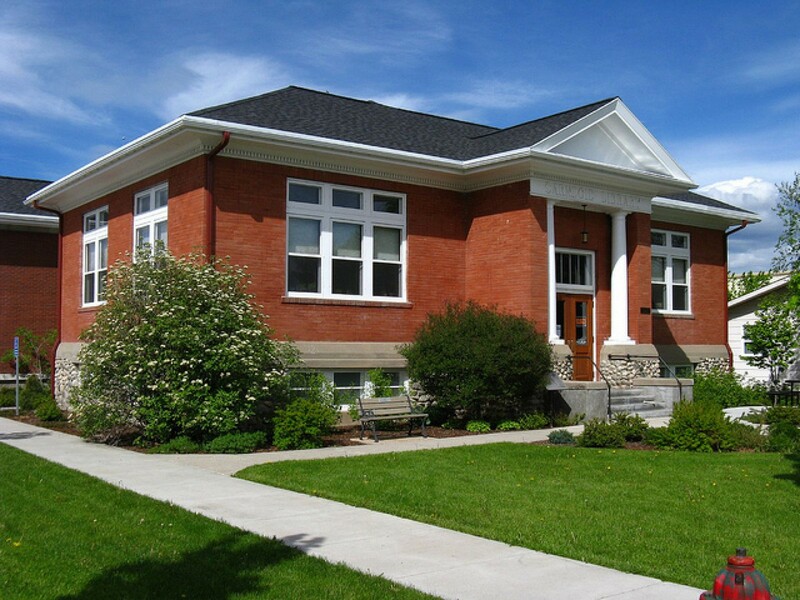 For over 100 years the Carnegie Public Library has provided the community of Big Timber Montana with an enduring resource for reading materials, entertainment, cultural programs, as well as a public meeting place for the exchange of ideas and knowledge. To this day CPL continues to serve the city and county with outreach programs and community events as well as providing reading and research materials. The building continues to be an architectural and cultural anchor in big timber and is representative of the understated, yet enduring community it serves. Likely influenced by the American Progressive Movement sweeping the country at the beginning of the 20th century socially minded idealists in Big Timber began the initiative to construct a permanent brick and mortar library between 1902 and 1912. The notion of constructing a permanent building dedicated solely as a library quickly spread through the community and became a symbol of the enthusiasm and commitment to shape Big Timber as a more enduring town. This was in keeping of a national trend with the central interest to modernize municipalities all over the country exemplified by the construction works of courthouses, schools, civic centers, and libraries. In 1911 the president of the Big Timber Library Association, a Mr. J.A. Lowry, wrote to Andrew Carnegie requesting funds for the construction of a library. In the spring of that year the Big Timber Library Board received conditional offer from Carnegie to provide funds for the building. It took until February of 1913 before a property could be secured to build on. The award of a grant by the Carnegie Corporation meant that the new library building had to meet with the architectural guidelines of the Carnegie Library program. The architectural firm of C.S. Haire and J.G. Link of Billings, MT. were hired to design a building that would meet the Carnegie criteria. The Big Timber, MT Carnegie Public Library was built in 1913 thereby formalizing the circulation and dispersal of printed materials, acted as an educational anchor and provided for a permanent public service building for the community. The Carnegie Public Library, 314 McLeod Street, Big Timber, MT was listed in the National Register of Historic Places on July 11, 2002. The stately library displays a standard Neoclassical design for Carnegie libraries constructed after 1904. Its architectural details and standardized floor plan are representative of the philosophy and goals outlined by the Carnegie Corporation Library Program. The architects, Link and Haire, were the premier architects in the State of Montana during the late 19th and 20th centuries. The library building was constructed by a local construction firm Gagnon & Company. The Big Timber Library is located centrally on McLeod Street which is the main thoroughfare in town. The one story, rectangular, brick building displays a standard design for Carnegie libraries built after 1904 and is constructed on a split river rock foundation featuring a day-lighted basement. Indicative of Neoclassical design architectural details include a pedimented entry partially supported by Roman Tuscan columns; an elaborate boxed-eave with a moderate overhang and dentils beneath; and symmetrical fenestration. Announcing a new procedure to renew library materials online: Use the account access links on this page and log in to My Account with your Carnegie Public Library card number. The default PIN is CHANGEME. Once you are logged in you can renew your library materials, review our new items, or search the catalog. Call us if you require further assistance.